for the Kreativ Blogger award. Much appreciated ♥. 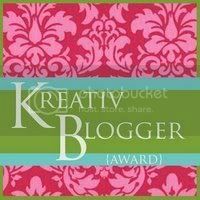 I received this award a few days ago and have passed it to 7 other blogs. I'm glad everyone likes the On The Beach kit and thank you for the lovely comments! I had a lot of fun making it. Hi I am just letting you know I admire your work and want to give you an award. Stop by my site to find it. Scroll down until you find your name!